We are big believers in the phrase: “you can’t be what you can’t see”, penned by The Children’s Defense Fund founder Marian Wright Edelman. It holds a lot of meaning for our site because nearly every article is about pushing the existing limits and barriers to ensure girls and women everywhere have the ability to see what is possible because of the visibility of a role model who has paved the way. 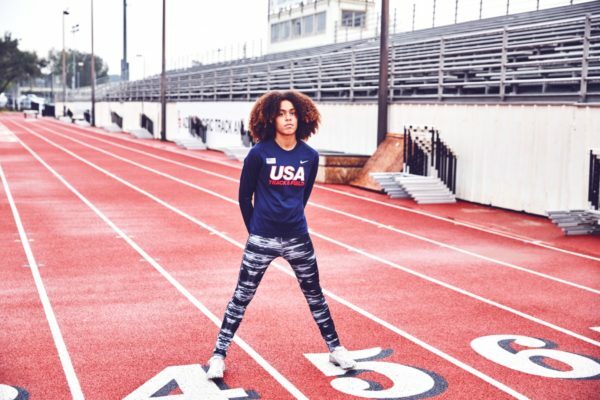 Over the past few years we have witnessed the uprising of some pretty incredible female athletes who have defied stereotypical narratives about women in sports. Whether it be Serena Williams proving she is one of the best athletes in the world by matching Steffi Graf’s record of 22 Grand Slam titles, Ronda Rousey showing the testosterone-fueled MMA world that she can bring in millions of dollars and viewers into an arena that previously did not allow women to compete (UFC), or the US Womens’s National Soccer Team winning their 3rd World Cup and demanding they be paid equally for their accomplishments. This is now the legacy young girls around the US are growing up watching and it is certainly having a trickle-down effect. 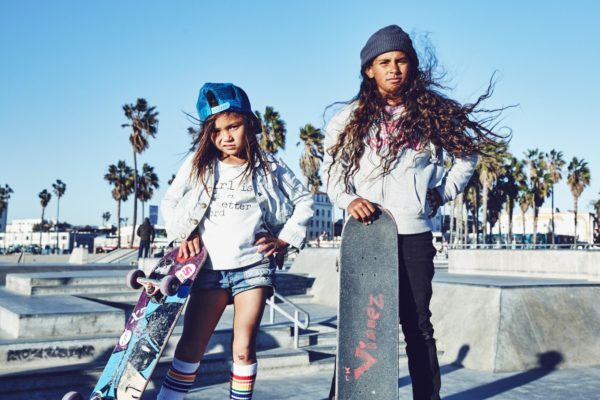 We’ve showcased a number of young female athletes as well as the campaigns and projects being launched to elevate their stories. 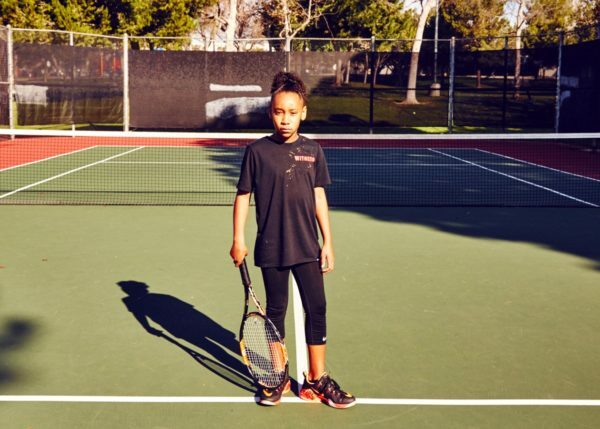 With studies showing how beneficial sports participation can be for a young girl’s self-esteem and overall health and well-being, the need for visible role models and continual encouragement can never be overstated. She Plays We Win is like no other photography series we have seen on girls and sports, it is amazing! What sparked the idea for it? Well thank you! It’s my heart & soul! I started this project in November 2015. At that time I was searching for a way to give back with my photography, to be a voice for something I really cared about. The day I just started photographing these girls and asking them questions about why sports matters – I found myself too. This entire year has been about throwing fear away & pursuing dreams for me personally. After years of producing photo shoots while building my book as a photographer – I finally made the jump to being a full-time photographer. For anyone that knows this industry, the jump is scary. And it’s not easy because it’s so competitive. I felt like I needed to do something to stand-out. I came to a point in my career where I was looking for inspiration, searching for something that got me excited, that I really stood for. I want to shoot something for the world, something I’m passionate about, that I care about. I realized it was right under my nose. The same type of courage my life requires right now (to take risks, be willing to fail, be a teammate, work on getting better, etc) is the exact same stuff I learned on a softball field when I was 10 years old. So, I started thinking about my life, I was thinking about when I was 10, If somebody older than me (especially a cool older girl) told me I was good at something or that I was pretty (even when I was wearing a dirty jersey and cleats) I never forgot it, it gave me loads of confidence. That sentiment is exactly what I want to do on a larger level with #sheplayswewin. Tell us about the growth of this project and what the reaction has been? I’m so thrilled that people are excited about the project! The wonderful support has definitely exceeded my expectations. People have been so incredibly supportive about it all! To see what happened after I finally trusted my heart is what amazes me. I stopped trying to make my photography for anyone else and started doing it from the very bottom of my heart and choose a subject matter that I believed in whole-heartedly! If there are any artists, creators, or dreamers out there that have idea – please just start! Just go for it, this project has proved that if you go with your heart, keep pushing and like the girls say “BELIEVE IN YOURSELF” anything can happen. We seem to be at a moment in the zeitgeist where people are talking about the need to show more female athletes, especially on major television networks. Has this impacted your perspective on SPWW? It definitely contributes to the overall excitement of the project. The direction the media is continually growing is positive! I think people are enthused about positivity in the media women. I don’t think that my project would have the place it does even 10 years ago! 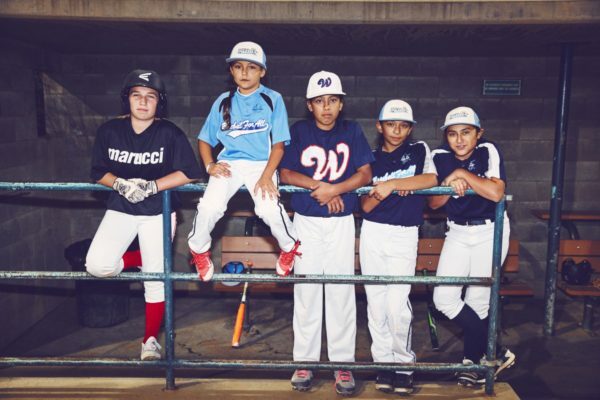 Girl are demanding more time on the field, and research in recent years has shown us over and over again the many benefits growing up with a sport. I’m just trying to have people talk about that, make it a conversation through words and images that inspire and influence perspective! She Plays, We Win just wants to give girls a place to share passions for the game and encourage you to take back a platform for positive community in social networking. It’s a place to empower each other and, in the process, realize the power of your own story. Whether it’s equal pay, body image, or fighting for equal air-time, it seems there are so many obstacles for female athletes. How do you think these issues affect the young girls you photograph? These issues are ever present for all ages of young girls & women. They’re all faced with something in this realm & obstacles because of their gender. That’s why we have to teach the youth about confidence, self-respect and what equality should look like at a very young age. They are the hope of the future as we hopefully work to reduce some of these issues in society! This exact sentiment and the things that young girls are faced with is why my project even needs to exist. Girls today are faced with an unrivaled amount of pressure in this day age. My images are meant to combat this a little and increase self-esteem and view of ourselves as young women! All these girls where 7 or 14 are already facing these issue and will continue to face bigger issues like equal pay as they get older. If we can prepare them to be confident, free thinking, independent women (something that I personally believe can come greatly from participating in sports) and fight for what’s right for women as our society progresses than the world will be a better place. What have been some of the most outstanding stories you have heard from the girls you photograph? I’ve shot over 15 sports so far & really only feel like I’ve scratched the surface of what’s possible. In terms of most inspiring – I barely know how to answer that because every single girl, every single story inspires me for different reasons. I love this more than anything I’ve ever done in my life. I get so much joy out of goofing off with the girls. Once they hang with me for an hour or so, they see that I’m just a huge dork & they can be 100% themselves & are comfortable, that’s when the magic photos start to happen. Beyond that, getting emails from all over the country on how these photos are inspiring girls to do what they want to & not give up – well that I guess is my favorite! To inspire girls I don’t even know with positive images?! I get to do that!? How did I get so lucky? I love the girls. I love their stories & their rad little unique personalities & I love telling their stories so more people can experience all this. How do you find all your subjects and what is the process of featuring them on the site? In the beginning I did research and contacted different teams, explained what I was doing & went out to photograph them. As the project got noticed more, I was able to use social media to connect with girls. And, word of mouth of course. A lot of times I’d photograph a girl & either her or her parents would tell me about a friend that they knew with a cool story, or a special passion for sport. Like I say, the support & morale around the project has made it what it is! Any girls’ story is worth being told. What is your ultimate goal for SPWW, and explain your intention behind the “we win” part of the title? 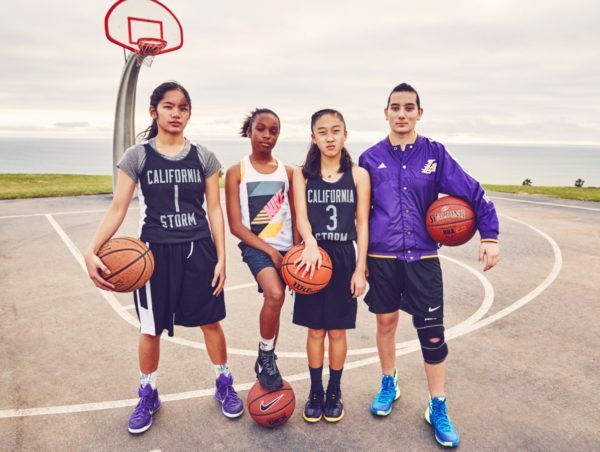 ‘She Plays We Win’ is meant to be a positive and empowering statement about girls playing sports. It literally means, if young girls participate in sports (and are encouraged, celebrated, & challenged at a young age). She Plays We Win is an ongoing photo series, a movement, and a community dedicated to uplifting young women in athletics. She Plays We Win is real girls getting tough, getting dirty, rising to the occasion every time. The simple goal is to celebrate girls everywhere in athletics & be an inspiring contribution to the media and how we view girls! Social media has made connecting with each other easier than ever, but it’s also made it easier to bully and bombard young women with confusing and impossible images of beauty and “femininity”. We are here to show that strength is beautiful. Perseverance is power. And confidence is super cool. I hope that the movement & project continues to grow. My heart is completely in this. It’s so incredibly important to highlight these young women now before they even get to an age that they can question themselves. They are so powerful and confident right now, All of can agree that high school can be tricky to navigate and girls need to already have a big grasp on their self-esteem before they even get there! My idea is that if we create more images like these & more little girls post these type, it will inevitably increase self-esteem & individuality for young women. 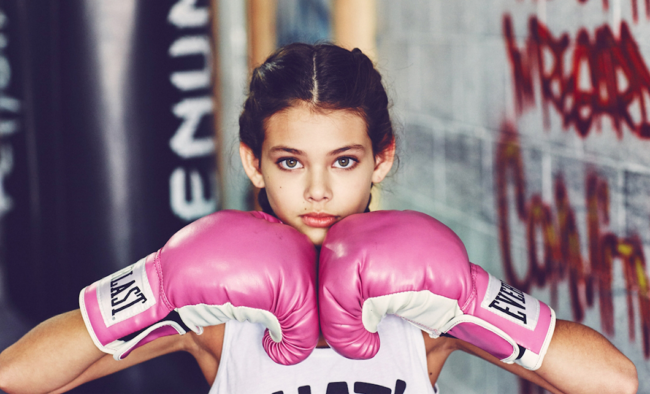 To be a young girl in society today is so hard, you see so many images constantly on what it means to be beautiful & frankly we need to see more athletics, more strength, more tough little girls that can hang with the boys, more little girls with their own style. Something we like to ask all our interviewees: What makes you a powerful woman? Wow, I love this question. My gut reaction to the question is freedom. You see, not a day goes by that I don’t think about my freedom & how very powerful that is. It is important to remember that not every woman in this world has the freedom I’m talking about, very sadly – not everyone is allowed that power. I am fortunate to be free to dream, free to say what I think, to photograph what I believe – this is power I believe. If we can continue to work towards equality, more and more people will have this freedom of thought & expression; And that to me is the ultimate power! I have the freedom to influence people with my art and I can’t imagine something more exciting & powerful for one person! I believe with my whole heart that it’s my responsibility to use power for good influence. Be sure to check out more images and stories over at She Plays, We Win and get to know a bit more about Christin Rose and her work by going to her website.